I can hardly wait to see how well 19 runs and what it looks like. or in an environment that has any critical process's in place. the General Idea of any Beta is simply to "Test Drive" the thing. Still running strong, no hiccups, full install, no worries. You have seen no software which fails to load? I had a problem with Kolourpaint4 and Mahjong. Also you are not using Chrome, right? If you would, try loading Kolourpaint4 and if you can then the problem is with my system only. Thanks. EDIT: The Software manager is cooperating today so installation is happening albeit slowly. Still the Chrome browser is loaded but unseen in the menu manager. Last edited by Ozo on Mon Jun 04, 2018 11:30 am, edited 2 times in total. It took more than 4 hours to download the iso. Is that normal or am I just slow? Aside from the wait the rest of the installation seemed flawless, sound was on and the internet connected. Once loaded my custom icons look fine and the Cinnamox (with transparency) theme is perfect. Still, it is the same Mint, same menu, same panel. EDIT: It takes over a full minute to start and a restart is also over a minute. Last edited by Ozo on Mon Jun 04, 2018 2:41 pm, edited 6 times in total. Generally looks impressive. Usual new release problem with Wine deb in Ubuntu repository not working. Hope that gets sorted out soon. There are a few threads on this in the WineHQ Forums. I agree, takes a serious amount of time to boot. I thought I'd messed up an fstab edit it was taking so long. Did a fresh install today on another rig. Stand by my previous comments but its working fine and the updates have started coming down the pipes with regularity. Once booted its fast and responsive. Thumbs up here. no software fails yet, chrome installed fine. my computer specs are in my signature at the bottom of my post. isn't kolourpaint4 used in a KDE distro? I do not use my computer for games, got 'xbox one s' with 3 TB external drive for games. kinda saves my forehead from being slammed on the desk. I also refuse to load any programs until i am ready to use them. like steam and orgin. too much resources used. My shutdown times are between 9 and 4 seconds , my boot times from post beep is between 1m:04s and 1m:08s my boot drive is a seagate 500mb sshd, hybrid solid state. The only issues i have is that much of the computer software industry is focused on windows. For instance I can not use the motherboard software utilities to manage power use (ASUS). not really a big issue I have lived thus far. 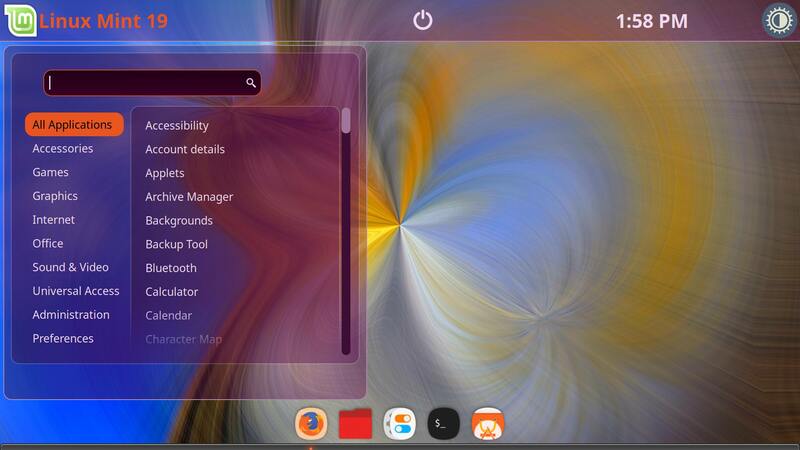 Sorry, but the notification panel, is not like that of gnome3? setting for individual apps? Solution here to slow boot time. I ran this fix and it now boots at light speed. The problem was due to my swap being encrypted. So the local-premount script in initramfs was waiting for a swap device that was not available, until it timed out. The relevant message was gave up waiting for suspend/resume device. To disable this (as resuming from swap is not possible with an encrypted swap, and I don't use hibernation anyway), I modified this file: /etc/initramfs-tools/conf.d/resume. In this file, a line with RESUME=none (instead of the UUID that was here) will disable waiting for a resume device. Run sudo update-initramfs -u to apply the changes. I would like to pursue this but in a new thread please. See link below. Working perfect Linux Mint Tara beta release on my laptop. Only not working perfect is notification. System is stable. Installed 19 cinnamon last night and so far works pretty good. wine not working and gdebi not working unless you start it in a terminal with sudo gksudo no longer works in 19.
other than that everything is fast and looks good. Works for some but not others, very strange. Mine works perfectly now that Chrome and .debi are installed. I do not use notifications. It is hard to believe this is the beta. I have seen some operating systems which took a year to sort out major problems (Windows 10). There are not even problems like when 18 emerged. I remember many, drivers were not right etc. etc. I had no screen tearing with 19, perfect. Congratulations for getting it right so soon after the beta was released. You must have had a battalion of techs working night and day or perhaps the wee folk aided you, hmm. Hopefully that will be fixed soon! I haven't tested the Mint 19 editions yet but that does come as a surprise. That does seem slow, just downloaded the Mint 19 Xfce ISO at approx 1.12 - 1.15MB/s; took about 25 minutes for the complete download, using the University of Kent UK Mirror Service. Is it faster than 18.3? Not only booting but operation also. I downloaded the torrent this time in exactly 8 1/2 minutes and then made a bootable usb drive while I checked the sha256 which was fine. The entire process took only eleven minutes. The entire process took only eleven minutes. I downloaded a couple of Linux ISOs using my mate's phone hotspot last Saturday & was getting similar speeds (i.e. about 3x the transfer rate I get on my home connection). He's got loads of data left which the provider will swipe at the bill date. My phone connection is dead slow, unfortunately. It'll be worth trying a download at the local brewpub, where they have fibre broadband.